The Wits School of Mining Engineering has been granted a five-year renewal from ECSA.The Engineering Council of South Africa (ECSA) accredited the Wits School of Mining Engineering for another five-year cycle allowing it to remain within the global accreditation association. Through this accreditation, graduates will also receive international recognition by employers and universities in other countries. ECSA’s primary role is to regulate the engineering profession in terms of the South African Engineering Profession Act. Its core functions is to accredit engineering programmes, registration of engineers as professionals in specified categories, and to regulate engineers while they’re practicing. The accreditation allows mining graduates to register with ECSA first as candidate engineers and later in their careers as professional engineers. This is as a result of the accreditation being in line with the Washington Accord guidelines. The Accord is an international agreement between countries responsible for accreditation or recognition of tertiary-level engineering qualifications who have chosen to work collectively to assist the mobility of professional engineers. About ten countries are part of the Accord including Australia, the United Kingdom and the United States. The Wits Mining School continues to grow. Neingo also said that the accreditation means that the Mining Engineering School continues to be recognised internationally and that Wits as an institution continues to hold a high standing on the international stage. “Accreditation means that the school’s teaching and learning processes are of the highest standard as any other leading mining school in the world”, she said. The renewal of the accreditation is based on four criteria that include credits, knowledge profile and coherent design, assessment of exit level outcomes, quality of teaching and learning and resourcing and sustainability of the programme. The school remains one of the largest mining engineering schools in the world, with student numbers remaining steady at about 850 undergraduates and postgraduates in recent years. Wits Vuvuzela, School of Mining Engineering receives a bursary injection, March 15, 2014. 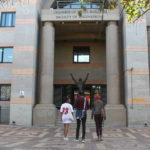 Wits Vuvuzela, Mining engineering pass rate increases, May 11, 2011.